This is a veritable master class in contemporary card magic. 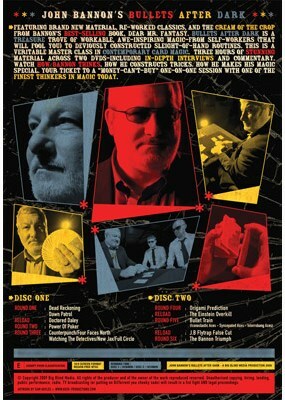 Three hours of stunning material across two DVDs-including in-depth interviews and commentary. Watch Bullets After Dark to see how Bannon thinks, how he constructs tricks and how he makes his magic special. 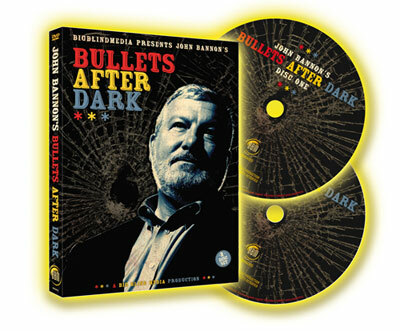 Cardzilla might not be coming anytime soon, but Bullets After Dark is the closest thing. The production values are amazing; this really is one of the best DVD sets to be released in the last few years. It gets our highest recommendation. Vanishing Inc. cofounder, Andi Gladwin was on set interviewing Bannon for the DVD and hosting the Bullet Train chapter. Release date: 4th November 2009. I recently meet John at a convention and man he was a wonderful guy. Answered any and all questions I had and was so nice! I've studied most of his magic but I didn't Bullets After Dark until now and I'm so happy with it!